I am indulging in Jill Lepore’s Book of Ages: The Life and Opinions of Jane Franklin a second time. As is the case with many beautifully written books, there are different things that grab my attention on this reading, little details I missed before. 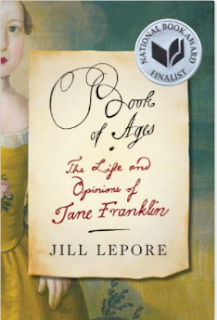 One tale of Jane’s brother, Benjamin Franklin, leads me to a question and an observation. When Ben Franklin was still in his minority, he wanted to write for the Courant newspaper, where he was apprenticed. Assuming his brother, the printer, would not accept his youthful prose, he posed as Silence Dogood and slipped his essays under the door of the print shop. Silence Dogood was a woman, a widow with three children and a strong will. When Widow Dogood related her biography, through Benjamin Franklin’s words, she confided that she had worked for a minister who gave her free rein of his library and “deny’d me no Accomplishment that could be attained in a Country Place.” The Widow Dogood, believing she was as entitled as any man, rarely kept her silence. History is sprinkled with stories of women who posed as men, in order to have their writings published and read by others. But how often did a man pose as a woman for the same reason? Benjamin Franklin, behind the mask of a woman, expressed his support for the education of women. The word feminist was not part of the English vocabulary until almost a century after he lived, but perhaps he would not mind if we christened him a colonial feminist.